There is no question word’s matter. The Bible even says that reckless words can pierce like a sword” (Prov. 12:18) and have the power of “life and death” (Prov. 18:21). We get this in the workplace and so try to watch what we say and how we say it, so as to not get fired. We understand sarcasm and yelling don’t help us get promoted. But, I wonder if we apply these same principles at home? Are we as careful with what we say and how we say it with our spouse and children? I was at a conference a few weeks ago and began thinking about my struggles in this area. What messages were my children receiving from me through my words. I wish I was more patient. I wish I could say I never yell and am always graceful. As I spent time thinking about all the things I wasn’t doing well, one session speaker (Patrick O’Connell) shared something simple I could do to immediately make a positive change. The speaker shared that as part of his Church’s leadership development process, leaders are encouraged to have an “ICNU” conversation with potential leaders. It may take a long while to work on my patience, but I knew I could apply this to my parenting leadership right away. How many ICNU conversations have I had with my children, discussing the potential greatness I see within them? I began to think about the specific gifts I see in my children and wondered if I’ve ever told them those things? A week ago I was walking my kids to school and said, “Do you boys know I love walking you to school?” My oldest replied, “No, I didn’t know that.” I asked why he didn’t know and he said, “Because you’ve never said that before.” Clearly I have some work to do. But, this is worth working on. “ICNU” are potentially the four most important letters in a parent’s vocabulary! The words we use to describe our children will help them develop their identity and self-concept. A little over a year ago our family friend Leah Huff posted on Facebook how she loves how her husband has their daughters speak a short sentence every morning about how they’re beautiful, loved, smart, and a few other things. She said he was continuing a tradition his parents began with him. I absolutely loved this, so wanted to use it for my children. I wasn’t sure my boys wanted to tell me they were beautiful every single day, so I adapted it appropriately. So, sometime last year I began having my boys tell me every single morning before they head off to school, “I’m smart, talented, good-looking, and loved.” My hope is that this repeated phrase will help them define what they think about themselves, what I think about them, and also how God made them. You can ask me in ten years if it worked. Today, take a few minutes and think about your children’s gifts and potential, then go have an “ICNU’ conversation. It doesn’t have to be long or complicated. (Children typically have the attention span of a chipmunk, so you probably have a minute or less of their focused attention anyways.) But, maybe before you put them to bed tonight, share with them one way you think God made them special. I love when I give one of my children a compliment and see a sheepish grin slowly grow on their face. Let’s create some sheepish grins on some faces this week. There are days or weeks when my wife and I feel like we’re caught in a negative downward spiral with one of our kids. During these seasons it feels like every time we turn around that one child (it could be any of the three) is doing something we need to correct. As a parent these seasons make us want to run deep in the wilderness, punch a tree and shout at the moon. But, as a child these times can feel deflating and demoralizing. It also becomes a self-fulfilling prophecy. The more you notice, the more you notice. To combat this Jess and I have to make the very conscious choice to find something positive the crazy child is doing right and have an ICNU conversation. It’s especially hard to ICNU during these trying seasons, but ICNU conversations have the power to stop the downward death spiral and help a child find their emotional equilibrium again. Remember to share, comment, and subscribe. I love this message, Carter. When I think back on my kids favorite adult influences (coaches, teachers, other parents, etc) they were usually at their best and most authentic selves because they were reminded that they matter and have gifts, intelligence and that their random acts of kindness are seen and appreciated. These moments help them flourish. Maybe not right away but these affirmations go into their toolboxes for reference when they need it most. They need more than telling them they are obedient, well behaved, and are measured by school grades. We need our kids to know why they matter and how we see their ability to do great things now as well as in the future. (we don’t want them to think that we only say stuff to them because we have to say nice things. After all we are the parents). They need us to show them what we see in them from their past, what we see in them now and where we see that their special traits or actions could take them in their future. Most importantly, our kids should be reminded they are loved and that we have their backs. You can never say those words enough. It’s dangerous for us parents to “assume ” that when a child ‘s BEHAVING well and NOT FAILING at anything that they stopped requiring affirmations and feedback about what is seen in them. Many of us focus more on the kid who is loudest and overtly acting out. It’s so sad when I hear someone say that their mom only said she loves them just a few times in their life. The mom replies that her kid should simply already know he or she is loved and doesnt think its necessary to say it. 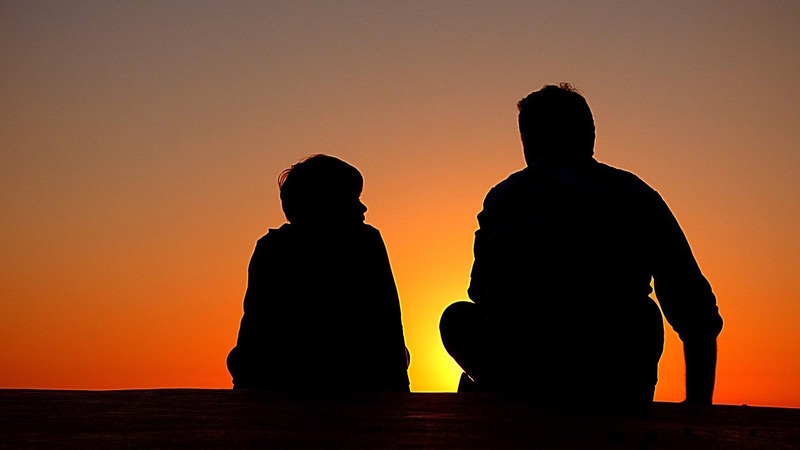 I imagine you are constantly evolving as a dad, doing your best to make these important connections with your kids, stumbling on occassion (as we all do) and that not only are you their rock but you possibly remind your kids they possess the ability to be their best selves when you convey what you see in them. They carry that with them even without knowing that they do. These things, I imagine, are also applied to your ministry leaders. I always sense a warm connection between you all. It would be great to remind leaders to do this within their life groups, music ministry, hospitality, outreach, etc. This encourages participants to keep returning to the group. We start the “icnu” with our kids, family , friends, coworkers, volunteers….these are teachable, “paying it forward” moments. Boy, I typed up a very long reply. I guess this post struck a thought or 2 from me. LOL! What great thoughts. Thanks for sharing.